Today’s first pick in The 2018 PopCult Gift Guide is a new album from Matt Berry, who has attained cult status as an actor on The IT Crowd, Toast of London and the upcoming What We Do In The Shadows. Berry is also a singer/songwriter, which is no surprise to fans of Toast of London, which incorporates his music into every episode. However, his latest release is a nearly-instrumental album of covers of British TV show theme songs. 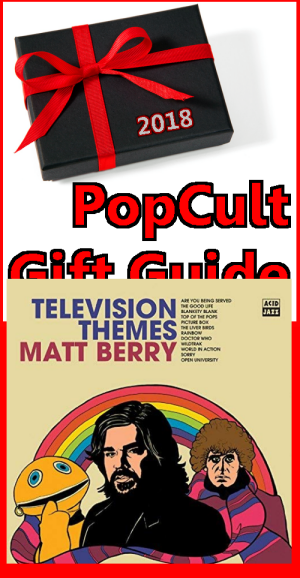 Television Themes is the perfect gift for the incurable Anglophile, or UK expatriate on your holiday shopping list, and is also a natural for fans of Matt Berry. It’s sort of bizarre, and also pretty short (songs range from eight seconds to just over three miutes), but it’s also pretty damned delightful, even for Americans who don’t have the nostalgic connection to many of the songs included here. Recognizable to us Yanks are themes songs from Doctor Who and The Good Life (known as “Good Neighbors” when they showed it on PBS). Less recognizable on this side of the pond are tunes like the Phil Lynott/Midge Ure theme for Top of the Pops or the short musical blips for London Weekend Television or Thames Television (although fans of Benny Hill will recognize the latter). Even if they don’t punch your nostalgic buttons, the songs here are pretty cool, played using vintage synthesizers and running the gamut from neo-classical to smooth Jazz to experimental electronic and pure pop. A handful of the songs have vocals, which Berry tackles admirably. 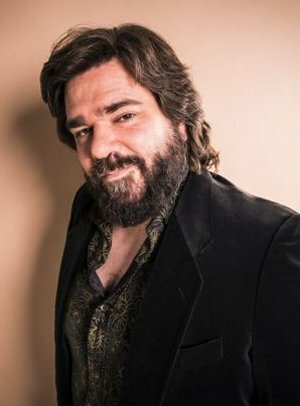 BAFTA award winning actor Matt Berry returns with Television Themes. Inspired by his youth, it’s a collection of TV theme tunes that have not only influenced Berry but undergone a fascinating and unique metamorphosis under his musical stewardship. Television Themes was recorded on his own and with his regular band The Maypoles in his newly built studio. It includes favorites from the ’60s, ’70s, and ’80s such as Are You Being Served? and Rainbow alongside lesser known themes from Picture Box and Wildtrak amidst those that transcend the decades, Doctor Who and Top Of The Pops. Combining his love of music production and his passion for the ‘signature tune’, Television Themes sees Berry enhance his musical reputation following the success of his previous releases encapsulating Berry’s formative years as a viewer and paired with his boundless appetite for music. The cover of the album enhances the retro feel of the project with line art that recalls British anthology records of the 1970s. Matt Berry: Television Themes can probably be ordered from local record shops, or for the sake of expediency, you can also find it at Amazon on CD and Vinyl.